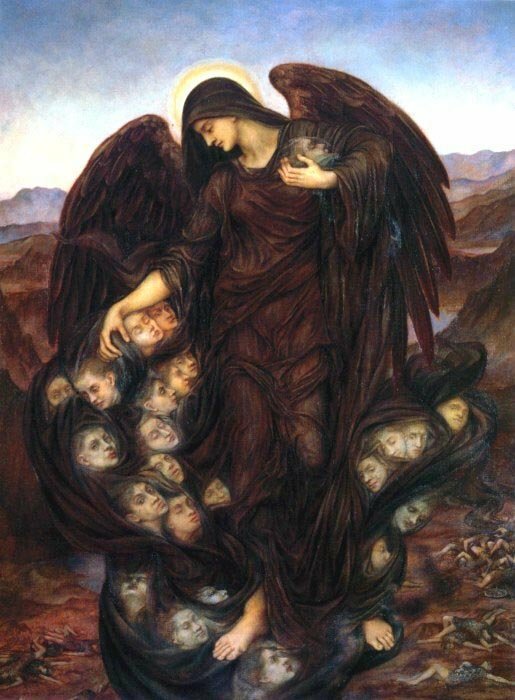 Judeo-Christian: Michael, Gabriel, Sammael and Sariel are all named as Angels of Death. Zoroastrianism: Angel of Death is Mairya. Rabbinical lore: 14 Angels of Death: Yetzerhara, Adriel, Yehudiam, Abaddon, Sammael, Azrael, Metatron, Gabriel, Mashhit, Hemah, Malach ha-mavet, Kafziel, Kesef, Leviathan. Germanic folklore: Odin in disguise. The word Grimmnir is a form of Odin; from that, we get the origin of grim in Grim Reaper. The Valkyries carry out the will of Odin in determining the victors of a battle, and the course of the war. Their primary duty is to choose the bravest of those who have been slain, gathering the souls of dying heroes or warriors found deserving of afterlife inValhalla. They scout the battle ground in search of mortals worthy of the grand hall. If you are deemed by the Valkyries as unworthy of the hall of Valhalla you will be received after death by the goddess Hel in a cheerless underground world. Celtic: Ankou (Britons); Angeu (Welsh). Slavic: No name – just a woman in a white robe with an evergreen sprout in her hand. One touch of the sprout will put a human into everlasting sleep. Hindu: Yamadats, agents of Yamaraj. What will your Angel of Death look like? Let’s examine the complexities of one of my favorite paintings, The Young Girl and Death, by Marianne Stokes. Notice how some of the petals on the flowers located on the chest beside the bed have fallen to the floor. Stokes shows us that “death” is present in the room in more ways than the obvious Death Angel. Just as that flower, half dead and half living, symbolizes the transition between life and death, the young girl experiences such a transition in the painting. We also see the necklace on the chest, symbolizing the fact that the young girl needs to “set aside” her earthly belongings, since where she goes now, no possessions will be necessary. Of the chest itself, we wonder if this could be the young girl’s hope chest – that perhaps she has not lived long enough to have married. After all, she sleeps alone. Death, personified by the Death Angel, startles the young girl out of her sleep. Ironically, this is a young girl, too young for death, yet unable to pick her time to die. We’re reminded of Emily Dickinson’s poem, Because I Could Not Stop for Death, in which the narrator tells us, “Because I could not stop for death / He kindly stopped for me…” Perhaps the girl is startled because, like the narrator in theDickinson poem, she does not have time to stop for death. Like most younger people, death seems distant – too far out into the future to consider. We see the young girl is modest – she clutches the bed cover in an attempt to cover herself. Perhaps pride / vanity have not yet eaten away at her heart. And though we think she is somewhat startled by what she sees, there seems to be no sign of fright in her expression. Perhaps the soothing gesture made by the angel does the trick of calming her. The large window on the girl’s side of the room is closed, symbolizing that the human, living part of her life has ended. The small window on the Angel’s side of the room is open, and light actually shines through, indicating that the part of life represented by the Angel is dawning (just beginning). 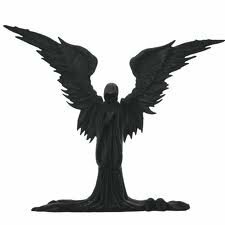 Now for the Angel: She (we assume this is a “she”) wears black, which is a symbol of death here, not necessarily a symbol of evil. As mentioned earlier, she calms the startled girl with a reassuring gesture of her left hand while her right hand clutches a light. This is a light of illumination – a sign to the girl that the Angel is prepared and able to guide her into the afterlife. The Angel sits on the bed in an attempt to make herself less intimidating (and frightening) to the girl. 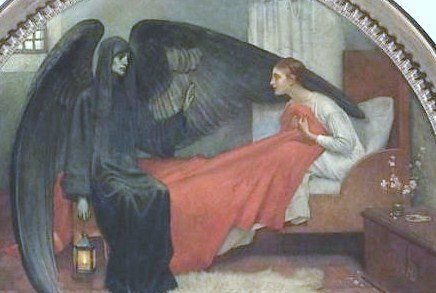 It’s one thing to awaken and see the Angel of Death sitting on your bed; it’s quite another to awaken with the Angel standing over you. In another attempt at comforting the girl, the Angel reaches over with her left wing and embraces the child. Now let’s back away from the details of the painting and look at the overall composition. For whatever reason, the painter decided to “frame” the details in some sort of actual, literal frame. We have a choice to make here – does the frame represent an actual picture frame or does it represent a mirror? If we decide on a picture frame, that could mean that this event we’re witnessing is to be examined in close detail, just as would do any painting (or as we’re doing with this painting right now) and that death itself is “a work of art” – something to be admired and not feared. If we decide on a mirror frame (my personal choice), then we are witnessing ourselves in the painting because a mirror never lies. In other words, one day we will face death, and so the painting serves as a warning to us not to be caught unawares. ” such is life ” we were born to die.